Perturabo was always meant for greater things. Like many of his brothers, the Emperor had great plans for his taciturn son that far out stripped the crude living Perturabo would find himself locked in to following the scattering of the Primarchs and his eventual reuniting with his father. 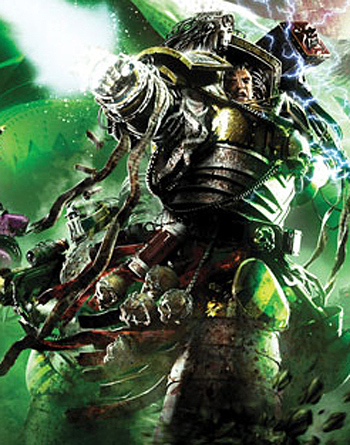 Perturabo was a Primarch like any other and so possessed a remarkable mind and tremendous physical strength. But unlike his brothers, when Perturabo found himself alone on his adopted homeworld of Olympia he didn’t seek to dominate his environment like Manus, overthrow a despot like Mortarion or unite a world like Johnson, he simply sought to understand it. Even when Perturabo was brought before the Tyrant of Lochos and other humans he paid them little interest and certainly bore them no love or trust. This wasn’t because Perturabo was incapable of such emotions – as most assumed – but because Perturabo was a remarkably complex soul to whom words were of little interest, and the lasting deeds of a man gave his true measure. However, for all his distance he also abhorred the loss of life, waiting until he was reunited with his father to oust the Tyrant of Lochos in a bloodless revolution. He was an artisan of superlative skill, fascinated with architecture and how it interacted with the world much in the same way as his brother in Ultramar. Such was his ability that he could turn this creative flair to any form of manufacture, including the fortresses he built for the Tyrant. As Perturabo took command of his legion he suddenly found himself responsible for the tens of thousands of lives. A responsibility he’d never had any interest in. Although natural leadership was locked within his living cells he lacked the charisma of Horus or the turn of phrase of Guilliman. Perturabo found himself conflicted. Charged with leadership despite no interest in doing so yet possessed by a powerful need to preserve life. He was an artist and artisan, forever pre-occupied with the creation of great works yet charged with destruction. He also discovered that, like his brothers, he had tremendous potential to undo the great works of other civilisations through the strength of his legion and his innate knowledge of construction. It was inevitable really that his Iron Warriors would become siege masters, learning all they could from their distant and unloving father. Indeed they mimicked him in all things, as did all the legions with their Primarchs. However his Iron Warriors misunderstood austerity and independence with a crushing sense of displacement. Perturabo simply didn’t possess the ability to care for his sons beyond a keeper of livestock caring for his flock. He simply couldn’t draw his mind from far grander ideals. The result, as the decades wore on and the Iron Warriors reputation as siege breakers preceded them they were flung into the absolute worst fighting the Crusade had to offer. At first Perturabo and his legion bore this duty with the misperceived indifference when in fact Perturabo was being driven ever deeper into himself, isolating him from his brothers and gradually leaving himself open to manipulation by anyone shrewd enough to realise that Perturabo was never destined for the fore front of war but to lead the sternguard, raising great monuments in the name of the Emperor. Denied the driving force of his soul to create it was little wonder that he and Dorn developed a resentment of one another. Perturabo was jealous of who he perceived to be a favoured son. In reality Perturabo’s own stoic and indomitable character was the reason he was so pigeon-holed. Equally, Dorn misunderstood the plain, relentless and seemingly callous approach to war. In fact it was nothing more than Perturabo trying to get the job done as quickly and as painlessly as possible. All in the hope that he could return to the calling of his heart at the Crusade’s conclusion. The burden of a poet’s heart forged into the body of a killer was terrible for Perturabo to bear and often was ill-suited to cope with it, his frustrations manifesting themselves in explosive fits of rage that his legion and enemies alike felt the brunt of. Like an artist forced to work in a mine, he was gradually being starved of creativity and his soul began to whither. And as he wandered into darkness his legion weren’t far behind, their tactics becoming every more brutal, culminating with the genocide on Olympia. The condemnation the Iron Warriors received from the Imperium was the final straw. It’s entirely possible that had the Heresy not broken out the Iron Warriors would have seceded anyway. By the time the Horus Heresy was on the verge of breaking, Perturabo was embittered and all but ostracised from his father and brothers, with no other voice than Horus’ promising a life free from the festering misery of the siege line. Of course it’s entirely possible that Horus engineered this isolation to make Perturabo easier to manipulate into breaking his bonds of fealty. The simple tragedy of Perturabo was that he was a dreamer and a shaper. He was equally cursed and blessed with profound understanding of the working of all things and the ability to make and destroy. Necessity forced him into being something he was never meant to be and was left to wrestle with his resentments and self perceived inadequacies. From the moment he was cast through the heavens Perturabo was trapped on a path of betrayal, isolation and bitterness.